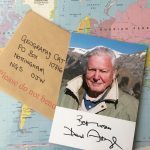 Geography Cat wrote to Sir David Attenborough to ask if he had time to send a postcard for the project, and was delighted to receive this lovely signed photograph. Geography Cat loves to watch nature documentaries, especially ones with birds tweeting! But Geography Cat’s human has been inspired by Sir David’s work for decades. In fact it was a programme in which Sir David was featured sitting close to Everest Base Camp that first caught her interest in geography and geology. Sir David was holding an ammonite fossil and explained how it had been lithified (turned to stone) at the bottom of the ocean and, that since then, the movements of the tectonic plates had lifted it to the top of the world where it now lay in the Himalayas. Since having her mind blown by that information she has always wanted to find out more, and tell anyone who’ll listen too. So thank you to Sir David, for the signed photograph, and most especially for the spark. ❤️sir David!!! He’s my cultural hero for my geography class!! !